Essence de patchouli de Alyssa Ashley es una fragancia pura y muy sensual, pensada para la mujer amante del estilo de los años 60. Las de centro son raíz de lirio, mientras que las del fondo son pachulí, madera de gaiac, cedro de Virginia, ládano francés, vainilla y almizcle. Patchouli eau de toilette 100ml spray. Fragancias para el. Fragancias para ella. para el cabello. Productos para niños. A punto de finalizar. En los anuncios viene especificado el lugar de origen del producto. A punto de finalizar. En los anuncios viene especificado el lugar de origen del producto. Anuncios a punto de finalizar. Nuevos productos. Fragancias para ella. Aseo y baño. Por que elegirnos. Reminiscence Patchouli Eau De Toilette Spray 100ml. Tipologia: Eau de Toilette. En logística no son días hábiles sábados, domingos y festivos. 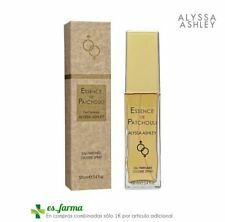 Essence de patchouli de Alyssa Ashley es una fragancia pura y muy sensual, pensada para la mujer amante del estilo de los años 60. Al igual que la fragancia, el frasco es simple, sencillo, de imagen pura y color blanco. Alyssa Ashley ESSENCE DE PATCHOULI Eau de parfum Vaporizador 100 ml. Notas de cabezaGeranio y rosa.Notas de corazónRaíz de lirio.Notas de basePachulí, cedro de Virginia, cumarina, vainilla, almizcle, ládano francés y madera de guayaco. Reminiscence Patchouli N'Roses Eau De Parfum Spray 50ml. Tipologia: Eau de Parfum. En logística no son días hábiles sábados, domingos y festivos. It is ideal to pop in places such as clothes drawers or bedroom cupboards - It will give a wonderful aroma to your clothes. You could also keep one in your handbag, suitcase, car or even hang around the house in small breathable bags. W e have no affiliation with the manufacturer/designer. Notes: Bergamot, Peony, Coriander, White Flowers, Rose, Jasmine, Ambrette, Patchouli, Incense and Woody. White Patchouli. The roll on design makes it easy to use. Simply use the roller-ball applicator to apply to desired area. ~EQUAL EARTH ~. The screw cap lid ensures no spillage when kept in your bag. Rest of World. Purchasing our products will help support communities who are mostly living in poverty. It will give a wonderful aroma to your clothes. You could also keep one in your handbag, suitcase, car or even hang around the house in small breathable bags. Why not take a look. Rest of World. Purchasing our products will help support communities who are mostly living in poverty. Il patchouli. Vietata la copia, l'utilizzo e la rivendita non autorizzata di tutto il materiale qui presente. Harlequin Graphic Web Design. Utente: Se ricevo un oggetto difettoso o diverso da quello acquistato?. Fragrance Body oil 10ml Max Strength New High quality, no alcohol. 10ml Best quality ! Best price. This product is easy to use direct on clean skin. Just roll – on! If irritations happens, wash with a plenty of water and discontinue to use. Heart : mimosa, rose, ylang-ylang. Base: tonka beans, patchouli, vanilla. Real parfum 20%. Promo price! each bottle of Prouvé parfum has a certificate confirming. Head: tangerine, orange, orange blossom. We have a choice of four different scents to choose from so whether your preference is fruity, floral or woodsy you are sure to find a solid fragrance stick that suits your needs. Other scents available include. Gastos de envío se especifican en la parte inferior de la descripción del producto. MPN Non applicabile. Más Información. tom ford white patchouli perfume 50ml. Condition is New, I had to take the outside plastic off to smell it. But isn’t my smell at all, so didn’t even spray it. So it’s is full and never used! I got it as a present and it cost £70 Dispatched with Royal Mail 1st Class. Patchouli di Reminiscence è una fragranza del gruppo Orientale Legnoso da donna. La fragranza contiene note di Cedro, Patchouli, Sandalo, Vetiver, Vaniglia, Fava Tonka, Labdano Francese, Balsamo del Tolù e Muschio Bianco. Patchouli by Reminiscence es una fragancia oriental amaderada para mujeres. La fragancia contiene notas de cedro, pachulí, sándalo, vetiver, vainilla, haba tonka, labdanum francés, tolú bálsamo y almizcle blanco. Top: Fruity notes, spicy notes, patchouli. Heart notes contain hyacinth, galbanum but ends with rich oriental notes of sandalwood, agarwood and musk enthralling ones. The delightfully sweet and sensual aroma of this oriental mukhalat has a very modern beginning derived from its fruity, spicy notes mixed with. Fragrance Note: Rose, Jasmine, Orange Blossom, Pink Pepper, Coffee, Patchouli, Cederwood. Because of this, IT is one of our most re-ordered product, making it the most sought after item. Spray fragrance 75ml. Base notes: Patchouli, Sandalwood. Floral/Fruity scent. The fragrance is characterised by contrasts and is for the classic, modern woman who has a youthful, feminine spirit. Presentation: 10ml Roll On bottle. A superb 100% pure Indonesian Patchouli Oil trapped in pure Grapeseed Oil. Ingredients: Grapeseed Oil, Pure Indonesian Patchouli Oil. Pure Pathouli Oil Grapeseed Oil. Atomiser Will give roughly around 40-60 Sprays. White Patchouli - 30ml. White Patchouli is unmistakable. Notes include Incense Burners. Base note: Patchouli, Incense, Woody Notes. Middle note: Rose, Jasmine, Ambrette. Female Clothing. Male Clothing. BY OUDH AL ANFAR. Patchouli, Animalic, Black Muck, Amber, Oriental Oudh, Spicy. 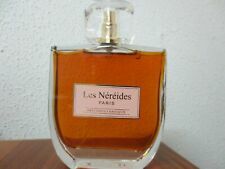 LES NEREIDES LE PATCHOULI ANTIQUE ROSA 100ML SUPER OFFERTA SPECIALE!!! LES NEREIDES LE PATCHOULI ANTIQUE 100ML SUPER OFFERTA SPECIALE!!! LES NEREIDES LE PATCHOULI ANTIQUE DUE FLACONI DA 100ML SUPER OFFERTA SPECIALE!! !